Shoes protect the feet; helmets protect the head. Helmets can be very effective at preventing serious head injuries, but nevertheless, head injury during active play remains a leading cause of death among children. Why might this be? A study in the August 2003 Pediatrics looked at hundreds of Massachusetts kids aged 4 through 18. When asked, most of the kids reported “always” or “almost always” using helmets when biking, skating, scootering, and skateboarding. When kids are observed, though, the numbers are often much lower – in some studies, as few as 12 to 15 percent of in-line skaters were seen to be wearing helmets. Among kids that are wearing their helmets, poor helmet fit has been shown to be associated with a higher risk of head injury. The kids in the Massachusetts study were asked to bring in their helmets to be checked. Ninety percent of them felt that it was “easy” or “pretty easy” to fit a helmet. The study found, however, that only a shocking 4 percent of the children had helmets in acceptable condition with a good fit. The biggest problems were helmets that rode too high on the forehead or that were too loose, allowing the helmets to slide forward and backward on the head. 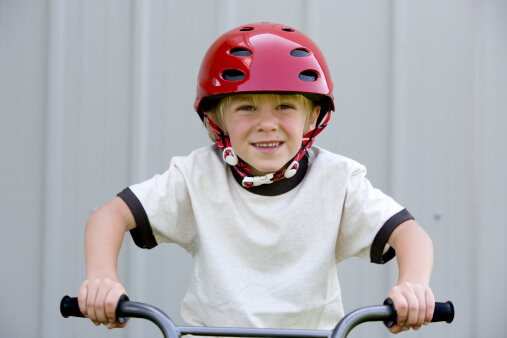 Paying attention to be sure that the helmet rests low on the forehead and does not slide from front to back could be an important way to help keep your child safe.